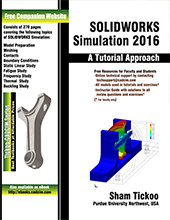 SOLIDWORKS Simulation 2016: A Tutorial Approach textbook has been written to help the users learn the basics of FEA. 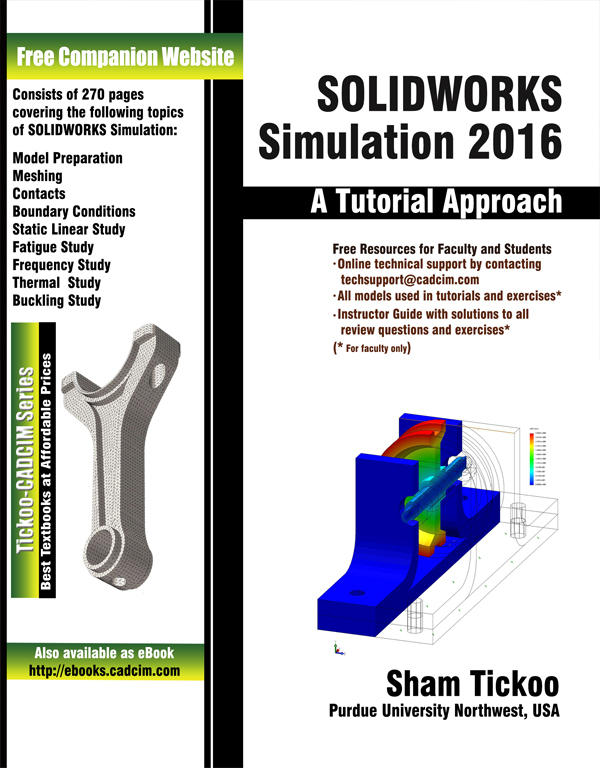 In this textbook, the author has used the tutorial point of view and the learn-by-doing theme to explain the tools and concepts of FEA using SOLIDWORKS Simulation. Real-world mechanical engineering industry examples and tutorials have been used to ensure that the users can relate the knowledge gained through this book with the actual mechanical industry designs. This textbook covers all important topics and concepts such as Model Preparation, Meshing, Connections, Contacts, Boundary Conditions, Structural Analysis, Buckling Analysis, Fatigue Analysis, Thermal Analysis and Frequency Analysis. Summarized content on the first page of the topics that are covered in the chapter. More than 25 real-world mechanical engineering simulation problems used as tutorials and projects with step-by-step explanation. Self-Evaluation Tests and Review Questions at the end of each chapter to help the users assess their knowledge. Additional learning resources at http://allaboutcadcam.blogspot.com. If you find any problem in downloading the files or the contents, please contact us at techsupport@cadcim.com.